Facebook: is sporting a new look and feel that’s in tune with iOS 7 design themes. Pocket: the excellent read-it-later app has refreshed its UI while keeping it elegant and clean and not going overboard with the new iOS 7 look. It has also added impressive background sync. Evernote: the powerhouse note and ‘second brain’ app has also had a major design overhaul for iOS 7. Byword: the superb text editor app has a UI refresh, a new iOS & enabled method of highlighting Markdown syntax, and support for AirDrop file sharing. MLB At Bat: is now iOS 7 compatible and updated for the playoffs and postseason. Some other notable apps for iPad with iOS 7 updates over the last several days are Launch+, Fitbit, Documents by Readdle, Drafts for iPad, AP Mobile, Khan Academy, Chrome, and many more. 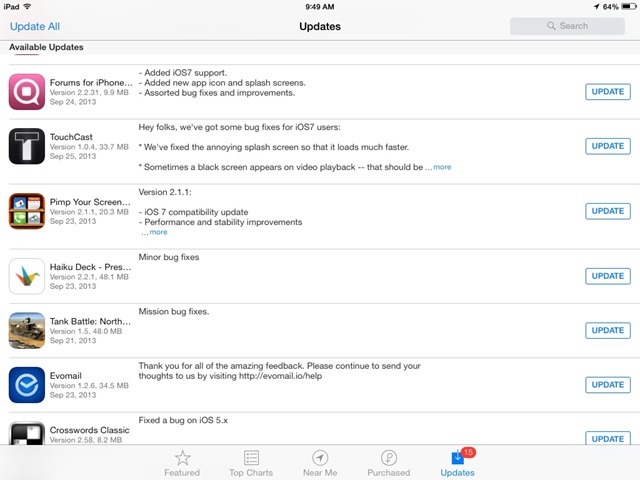 Oh, and my favorite iPad / Apple forum, everythingiCafe, updated their app for iOS 7 too. 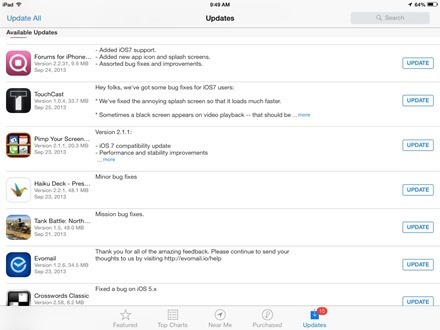 I hope you all are seeing the majority of your favorite iPad apps updated for iOS 7. Previous PostSponsor: MOBiLE CLOTH – A Revolution Against Touchscreen FingerprintsNext PostApp Store Near a Million Apps, Over 400K iPad Apps?